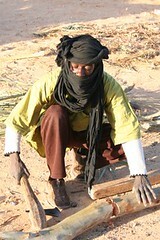 Ever since I saw my first photograph of a Tuareg, and heard about the legendary blue men who wrap their heads in indigo cloth which dyes their skin I have wanted to see Tuaregs. Hollis Chatelaine made a beautiful and haunting quilt called Blue Men. I kept running into images. 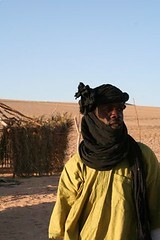 I even bought Tuareg photographs from a lovely photographer in Tripoli. 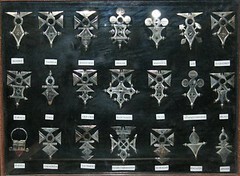 I even have the beginnings of a collection of Tuareg crosses - and these shapes are fascinating. They have no relationship to the Christian Cross and actually predate it. There are many different types, and different tribal groups use different cross styles - like Aran sweaters and families from Aran Island. 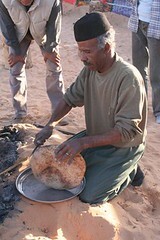 We drove out one evening while in Libya from Ghadames to visit a Tuareg camp. This was undeniably a good attempt to link to some tourist possibilities by one of the local men and his family. The tents were actually more Bedouin in style but they were in the process of building small round huts with palm fronds - and they were really interesting, especially since we had been looking at exactly this in the National Museum in Tripoli. Even the axe they were using was interesting, with a wedge shaped narrow head that went right through the handle - so every blow wedged it tighter. They drink a really unusual tea. It was heavily minted and boiled several times and sweetened, then poured from pot to pot really high so it foamed and frothed. This was poured over a cupful of peanuts - whole, and unsalted - in small glasses. Then the foam - greenish and looking like the froth on surf on a heavily windy day - is scooped onto your tea. I still haven't decided if I liked it. I had an oddness to the fact that the tea was very sweet and sugary, and the mint accent was terrific, but it was a bit like finding sardines in the bottom of your cornflakes bowl (don't ask). The peanuts were quite a nice snack, but I think I prefer mine not sogged with mint tea. There was also that uncertain moment when, stuck to the bottom of the glass by left over sugar and tea, you give it a sharp shake while hovering the glass over your open mouth with your head tilted back. Other than the fact that the glass jolts somewhat unpleasantly against your teeth there is a split second when you wonder how to stop the spray of peanuts from going straight down your throat unhindered. They also made up bread - and that was fascinating. It was unleavened and very like damper, but coated with flour and with sesame seeds and anise seeds and fennel pushed into the crust so it was very aromatic. It was quite dense, and patted into flattish rounds about an inch thick. The whole thing - quite amazingly - was then dumped into the sand and ashes and covered with more sand and ashes. I could hardly believe that it was not full of sand. There was the odd patch of ash scraped off - but otherwise it came out completely clean, hard on the outside and soft and steamy in the centre - a dense and delicious bread. Not one tiny bit of grit was in the pieces I had. I could quite easily have eaten the lot. 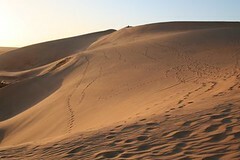 As the sun dropped, Bob and Sam decided to walk to the top of the dunes that backed the camp. It was high - dune after dune loomed above us in a seriously photogenic curvilinear landscape. Even the footprints of previous tourists looked good. I have lumped the photographs of the rest of the camp, some images of one very impressive young man in an amazing lime green (these were somewhat urban Tuaregs who see no reason to wear only blue when there are other colours available) and an image of the patchwork at the back of the tent into one Flickr set. Clicking on the images below will bring up others. Bob and Sam stood on top of the world and watched it all change colour. I walked halfway up to a point where I could look over the top at Algeria. The dunes' shadows lengthened and went silvery mauve, then purple and blue and the tiny ripples in the sand etched with the sharpest edges in gold and the shadows in deep dark purple. It was utterly beautiful. Sam and Bob were silhouetted against the sky so far away that they were hardly visible in the lens of my camera. To cap it all two young men came charging across the desert on horses. They were so at ease on the animals that they looked like centaurs and gallped straight up the sides fo the dunes to whirl around on one of the ridges and ride the ridge as black shapes against the flaming sun. Then they wheeled around and came past me. It was a spectacular evening. I don't know about the tea but the bread sounds delicious. I have seen photos of Hollis Chatelaine's quilt "Blue Men" and often wondered about it's background. It has been very hot in Canberra, 35o yesterday and 22o overnight. the bread (minus the extra trimmings), and the process of making it, are remarkably similar to damper made by a couple of indigenous friends here in Perth. This was the same shape and thickness you describe, cooked in sand and ashes in an identical manner, I didn't encounter even a single grain of sand, and like you I could happily have devoured the whole delicious loaf. Also, how reassuring to read your post and discover yet another example of people from vastly different cultures having practices which are so similar. The fellows who cooked your bread would get along just fine with my Aussie indigenous friends. As always your descriptions are marvellous and I almost feel as though I were there. Like the others, I would love to try the bread -- and even the tea! I've put a link to your blog on mine. What great adventures you're having - have you got ideas for quilts based on them? 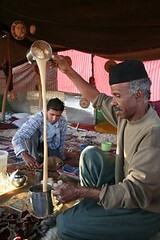 The strong mint tea is similar to teas of the Middle East, but I find the peanuts such a hoot. My husband is from Kansas and in the American mid-west, and also in the South, as mentioned in Sue Monk Kidd's "The Secret Life of Bees," they used to put peanuts in the bottom of their Coke. It is amazing the similarities in people's customs that surface. I so enjoy peering in on your travels. I am an Australian quiltmaker married to a diplomat (retired now). I have lived about fifteen years of the last thirty in the Middle East. This blog started in Egypt, and has morphed back to Australia with our return. I will leave the name the same but content will change.